I snapped this while at the 2012 MAS Convention in Long Beach during the Jummah khutbah by Imam Siraj Wahaj. 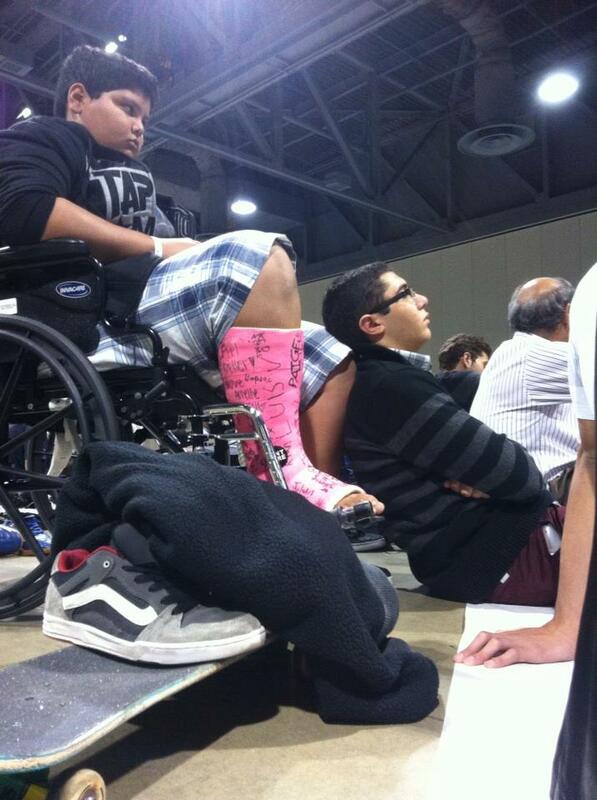 The kid on the floor is resting his head on the knee of his buddy in the wheelchair with the pink cast on his right foot. Love the brotherhood! I was fortunate enough to be at the 2012 MAS Los Angeles Convention in Long Beach where I got to listen to Imam Siraj Wahaj. He is, as one friend put it, the Imam of Imams in the United States and I love listening to him preach because of his combining of Black preaching with Sunni traditional theology. He calls out the Immigrant Islam that is pervasive in the community, but without alienating folks because he gently reminds them that here in America there is a mixing of cultures and no one culture is “Islamic” but rather we need to cultivate a uniquely American culture that represents our faith. His khutbah was pretty awesome. I loved the idea he presented about imitation. It was simplistic but was very much an amazing reflection and reminder for me. The Imam stated that imitation is an innately human characteristic. Its an attribute that can show the best in humanity or the worst, to that end the Imam said that we often don’t reflect on how we imitate certain people in our behavior and that we need to be cognizant of this. The best of people for Muslim to imitate are the Prophets and the best of Prophets is Muhammad SAW. Obviously the Imam said that we can’t embody everything but thats why there is the Sahaba and the righteous generation that followed them and from those people we can identify the characteristics that are most reflective in our individual selves and work to be more like them. So I haven’t posted a Friday round up for week 8. Partly because I had things going on and I didnt have much to post up about regarding the Khutbah. But I have been posting various blogs, for example I posted the fears I have about turning 30. Its kind of a big thing for me because of the situation I am in with my academic, professional and personal life. Lots of folks responding to that blog post with encouragement and sage advice about getting older. There were a bunch of posts about organic farming starting with one that outlines my thoughts about it, then it goes into my first do-it-yourself (DIY) project around organic urban farming and then a follow up on the fact that my worms were still alive. Next week I will post up some stuff on Blackamerican Muslims and the Third Resurrection a book written by Dr. Sherman Jackson. (UPDATE, had some time so posted an excerpt here.) I also hope to finish up Jack Kennedy by Chris Matthews, its been a book I have been reading for ages and just can’t seem to finish. Also in other news, I am going to start blogging for the Religious Left Blog on my experience with NewGround Fellowship. I also hope to have something posted on Altmuslimah hopefully in the coming few days. Aside from that I currently am wrapping up a post election reflection piece that looks at what American Muslim activists and leaders have to say about political activism moving forward in the next four years for Illume Magazine. Looking forward to December I will be in San Diego and Sacramento respectively and then back for the New Years, hopefully I can figure out my life sometime around then so that the New Year starts with something positive. In other news, I have to say I am disturbed by Black Friday. In fact I now refuse to participate in any shopping on Black Friday. I can’t believe that as a nation we would take time to give thanks for all the things we have and then trample on one another like wild beasts for the things we want to buy and might not even need. The deals are whack, the behavior is whack and the whole consumerist endeavor is on steroids. This video below was something that just made me shake my head in disgust.